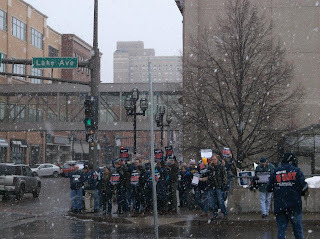 Amidst swirling snowfall, 75 hearty Northlanders turned out for a protest on March 24 in support of postal workers and keeping Saturday mail delivery. 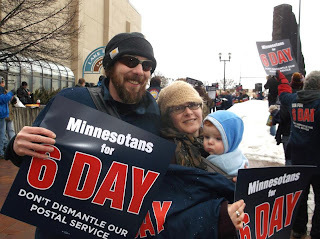 Following the announcement by the U.S. Postmaster General that six day mail delivery will end this summer, trade unionists and their allies around the country are trying to rally support to save Saturday delivery. March 24 saw protests, like this one in Duluth, in dozens of cities around the country. Cutting Saturday delivery will result in the loss of numerous jobs, result in less services for working people, and will make the Postal Service even more vulnerable to competition from high-cost private delivery companies. For years the powers that be in Washington has been trying to gut the Postal Service as part of their drive to privatize public services. The plan to cut Saturday mail delivery comes on the heels of efforts to shutter hundreds of rural post offices and reduce the number of sorting facilities. It's working people who suffer from these cuts in public services, and only the rich who benefit from privatization. We call on our of our readers to support the postal workers efforts to save Saturday delivery! To stay involved in this struggle, you can plug in via the Delivering for America website at www.deliveringforamerica.com. We'll also be sure to post announcements about any local actions on this site.